It was said that Mages throughout the realm gathered to test their skills and compete for one of several seats on the Council of Magic. Each Mage had hopes of gaining a controlling stake within this circle of power. That was 300 years ago! Now with the council in shambles, it's every Mage for themself in this struggle to rule the realm of Kenan. The Land Wars expansion adds a campaign setting to Tower Siege. 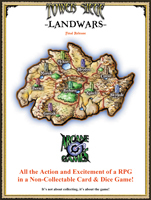 Land Wars is for 2-4 players. Play time is determined by the number of games needed to acquire the most kingdoms. 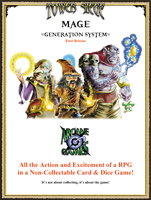 The Mage Generation System is a welcome addition to Tower Siege that allows players to take on the role of the Mage they design! There are 15 races and 7 magic classes that you can play in the realm of Tower Siege. You have 12 generation points in which to design your Mage. Use the character sheet provided to fill out your Mage’s appropriate stats. Choose your spells, quirks, bonuses and other abilities that will make your Mage unique. 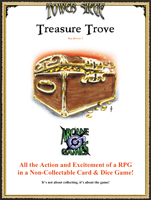 The Treasure Trove expansion is chalked full of treasure, traps, curses and bestowed abilities. This expansion for Tower Siege adds a new dimension to the game. Every enemy you defeat has a Treasure Trove, which will aid or hinder you in your quest for dominance. If one of your creatures defeats an opponent, draw a card. Possible treasure includes Potions, Gems, Loadstones and more… Reap the spoils as you raze your opponents army! Fight for Good? Fight for Evil? Fight for your Life!